ALLAMAND, JEANNE-CHARLOTTE (Berczy), colonizer and teacher; b. 16 April 1760 in Lausanne, Switzerland, second daughter of Jean-Emmanuel Allamand and Judith-Henriette-Françoise David; m. 1 Nov. 1785 Albert-Guillaume (William) Berczy*, and they had two sons, William Bent* and Charles Albert*; d. 18 Sept. 1839 in Sainte-Mélanie, Lower Canada. Jeanne-Charlotte Allamand, whose father was a draper and dyer, seems to have received a good education. She may have been employed as a governess when she met Albert-Guillaume Berczy, a painter of miniatures, who would later call himself William. They were married near Lausanne. Until about 1790 the couple lived in Florence (Italy), though he travelled frequently. While staying in London in 1790, they exhibited paintings at the Royal Academy of Arts, he a miniature and she two “Tuscan kitchen interiors.” She had perhaps received instruction in painting at Lausanne, and her husband had given her lessons in Florence. The following year he accepted the task of recruiting German colonists and accompanying them to the holdings of the Genesee Association in New York state. The Berczys and their son William Bent left with the first group of settlers in the spring of 1792. The agent of the Genesee Association, Charles Williamson, did not fulfil the terms of the colonists’ agreement with the association and Berczy left the settlement, near present-day Canaseraga, N.Y., late in 1793 to seek help. Charlotte and the Lutheran minister who had accompanied the immigrants were left in charge for the winter of 1793–94. Taking charge of the colonists was a role which Charlotte was to handle capably on several occasions. When William assisted in the formation of a new association, the German Company, to develop land in Upper Canada, she and the pastor were charged with organizing the settlers for departure without Williamson’s knowledge. Once in Upper Canada the colonists were given land in Markham Township. The Berczys themselves settled in York (Toronto). Shortages of supplies and the reluctance of Berczy’s backers to commit more money forced him to travel extensively to secure tools and food, often on credit. Again Charlotte was responsible for the affairs of the settlement, although she had some assistance. She also seems to have opened a haberdashery and textile shop at this time, probably to support the family. Since little or none of the money owed to Berczy by the settlers was being paid, she lived in near poverty. In 1797 Berczy’s claim to land, as a township proprietor, was substantially reduced and in order to appeal this decision he began a series of journeys which would occupy the rest of his life. Charlotte was again left in charge during her husband’s travels. At one point he sold their house and only through the sympathy of the new owner was she allowed to stay. William moved his family to Montreal in 1798 and departed for England the following year. He did not return until 1802. Charlotte dealt with matters concerning the Markham settlement through agents, first William Weekes* and then William Willcocks*, while trying to support her family. 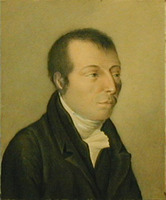 Even when Berczy returned, he spent the years 1802 to 1804 in York and 1808–9 at Quebec. Charlotte opened an academy in her rented quarters in Montreal to teach drawing and water-colour, music, and languages. By all accounts her school was quite successful. Probably her most noted pupil was Louise-Amélie Panet, daughter of Pierre-Louis Panet*. Louise-Amélie became a painter and art teacher and married Charlotte’s son William Bent in 1819. Charlotte also taught her son Charles Albert. After her husband’s death in New York in 1813 she continued to teach at least until 1817. At some time after 1817 she joined William Bent at his home in Sandwich (Windsor), Upper Canada, granted him as compensation for his father’s claims. There she lived a quiet life, occasionally painting as a hobby. About 1832 William Bent and his wife moved to Sainte-Mélanie, in the seigneury of Ailleboust which Louise-Amélie had inherited, and his mother apparently went with them. Charlotte died there in 1839. The letters between Charlotte and William are filled with expressions of love and respect. Charlotte was always a dutiful and supportive wife through all of her husband’s trials and tribulations. It was clearly her strength and talent that maintained their family during his absences. Without her efforts his colonization schemes would have been much more difficult to carry out and his family might well have fallen into abject poverty. ACC, Diocese of Montreal Arch., Christ Church (William Henry [Sorel]), parish reg., 21 Sept. 1835. AO, MS 526. AUM, P 58, S. MTRL, H. J. Cowan, ms and notes for a book on William Berczy. PAC, MG 23, HII, 6. Harper, Early painters and engravers. 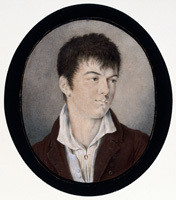 John Andre, Infant Toronto as Simcoe’s folly (Toronto, 1971); William Berczy, cofounder of Toronto; a sketch (Toronto, 1967). P.-G. Roy, “Le peintre Berczy,” BRH, 1 (1895): 172–73. John Andre, “William Bent Berczy (1791–1873),” German-Canadian yearbook (Toronto), 2 (1975): 167–80. Ronald J. Stagg, “ALLAMAND, JEANNE-CHARLOTTE,” in Dictionary of Canadian Biography, vol. 7, University of Toronto/Université Laval, 2003–, accessed April 26, 2019, http://www.biographi.ca/en/bio/allamand_jeanne_charlotte_7E.html.